On Wednesday, an injured mountain lion hobbled into town. He received a terrible welcome. The big cat was spotted in Omaha, Nebraska, on Wednesday evening. Suffering from a broken leg, he had curled up beneath the shelter of a building's wall. A picture shows him fast asleep, tucked into a corner of the building. That is, until officials stepped in. Though the cat was peaceful and showed no signs of aggression, officers followed Nebraska's outdated wildlife policy - which advises officials to kill any mountain lion that enters metropolitan areas, no questions asked - and decided he should die. Surrounding the sleeping mountain lion, officers used shotguns to execute the cornered cat. Each time he tried to rise, they would shoot him again. In one heartbreaking video ( click here to watch), officers can be seen and heard in the background. There are loud cracks as several bullets are shot off, followed by a long silence. The injured cat tries to rise, and another round of bullets rings out. Silence. Then another few rounds several seconds later when the cat again tries to stand. Silence, then another hail of bullets. Silence, then another. The injured, cornered animal was shot 16 times over the nearly minute-long period it took him to die, being shot multiple times every time he moved or mustered the strength to stand. "After the first shots were fired, the mountain lion rose up and officers fired until they were certain the animal posed no further threat to public safety and to end its suffering," the Omaha Police Department said in a statement. Now, people are furious with local officials and the Nebraska Humane Society, which inexplicably approved of the execution. The Humane Society's page is flooded with comments from outraged locals, with people calling the decision "deplorable" and "reprehensible." "'Experts' were consulted and their only solution was to shoot ... they may as well have consulted a handful of people on the street," one person wrote. Of course, some of the blame lies with Nebraska's outdated shoot-first wildlife policy, which advises officials to kill any mountain lions that enter a city, with no attempts made to rehabilitate them. Officers weren't even aware that the cat was injured and in need of help until they saw the body. Susan Bass, press relations representative for the Florida-based sanctuary Big Cat Rescue (BCR), told The Dodo that she strongly disagreed with the state's policy. "The lives of these animals matter," she said. "At least some effort should be made to try to humanely sedate the animal and take him to a wilder area." Though the policy implies that mountain lions pose a serious danger to civilians, experts said that assumption was far from the truth. "It posed no threat at all," Tim Dunbar, executive director of the Mountain Lion Foundation, told The Dodo. "We've seen the news report, we've read all the stories. All we're actually seeing is a lot of excuses." Bass said that, even injured, the mountain lion could have been saved if officials had wanted to. He could have been returned to the wild, where bones often heal on their own, she said. And while treating wild animals is difficult, BCR is currently caring for one mountain lion who had two injured legs. Omaha officials argued that tranquilizing mountain lions is dangerous because tranquilizers take time to work, leaving an increasingly drugged cat to wander the city streets. But as Bass confirmed, a simple solution is just to contain the animal until the tranquilizers kick in. "If the animal was in a confined space and wouldn't have had the opportunity to run, it would have stayed in the same place until it fell asleep," she said. "There have been numerous cities around the country where they've done just that." It's true that if the mountain lion had wandered into another city he might have had a warmer welcome. 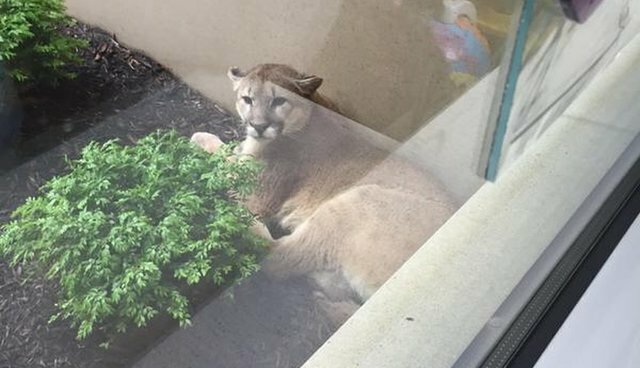 Just last month, a mountain lion took up residence under a Los Angeles home. Instead of killing him, local agencies rallied together and spent hours trying to get him to safety, with the public cheering them on. And even if the mountain lion needed to be euthanized - which is highly doubtful in this case - many outraged citizens are pointing out that there's no excuse for the brutal way in which it was done. At the very least, police could have bought in a trained marksman or even a hunter, so the cat could have been put down kindly. "That wasn't a humane way," Bass said of showering a sleeping cat in gunshots. "I can't imagine a circumstance where you'd have to shoot a mountain lion 15 times."